These AFR 180cc LT1 Eliminator Street heads are emissions-legal (CARB E.O. #D-250-2 for engines up to 1994), and are available in the LT1 angle plug version only. These heads feature a 55cc to 65cc combustion chamber (must specify) with a 64cc exhaust port and a 3/4 inch thick head deck (ideal for nitrous or blower applications). Valves are lightweight stainless steel 8mm stem, 2.020" dimeter intakes and 1.600" diameter exhausts along with AFR's hardened ductile iron interlocking valve seats. Standard valvetrain consists of AFR 8017 LS style valve springs and CHE titanium retainers with many other spring packages available. Their exceptional flow characteristics, ideal operating range of just off idle to 6,000 RPM (higher RPM ranges are possible, depending on the combination of parts). 23 degree valve angle and standard valve spacing make AFR 180cc LT1 Eliminator Street heads a perfect for 350 to 383 cubic inch engines. 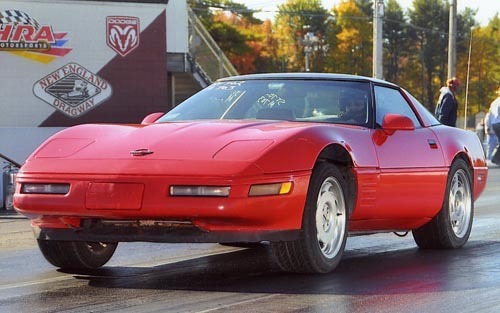 They are specifically designed for 1992-1995 Corvettes and 1993-97 Camaros and Firebirds. NOTE: Modern hydraulic roller camshafts typically experience valve float at 6200-6400 RPM because of their fast ramp rates. We suggest you upgrade your springs to AFR part #8019 or PAC 1221X with higher spring pressures and use the “Hydra Rev Kit” to reduce chances of valve float associated with 6200 or higher RPM usage. Click the button below to add the AFR 180 LT1 Street Ported Cylinder Heads to your wish list.